My mom used to make this when my sister and I were little. It was one of our most favorite dishes. Apparently, it’s also pretty easy even if you make the bread from scratch, but let’s be honest the frozen works just as good and is so much less time-consuming! Roll out the bread dough flat. Visually divide it vertically into thirds. On the right-hand third cut diagonal lines using a knife. Repeat on the left-hand side. 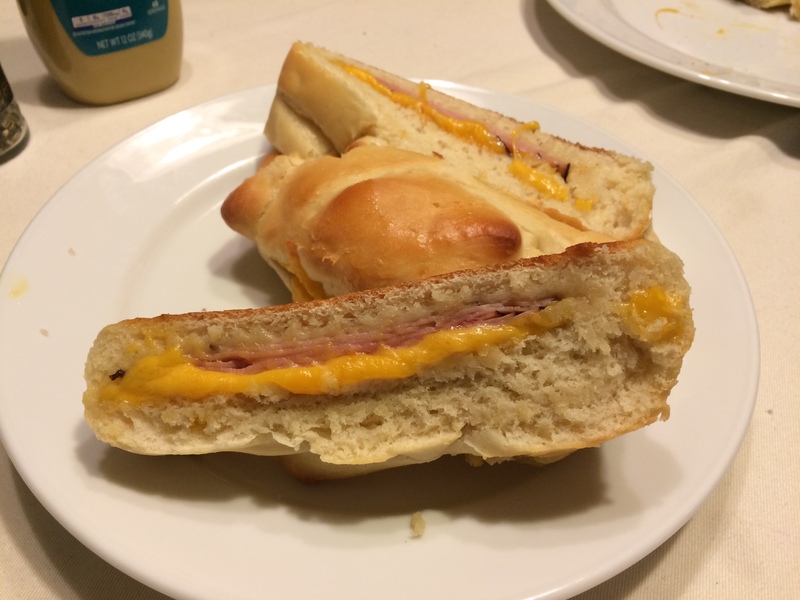 Layer the ham about four slices thick and then layer the sliced cheese on top. Braid the alternating the diagonal pieces over the ham and cheese. Bake per the package instructions. Just like mom used to make! Mine never looks as pretty as hers does, but it tastes just as good. I can't wait to introduce this to my daughter for school lunches in her future. Some people like to add a little mustard, but I'm a purist and like it plain. 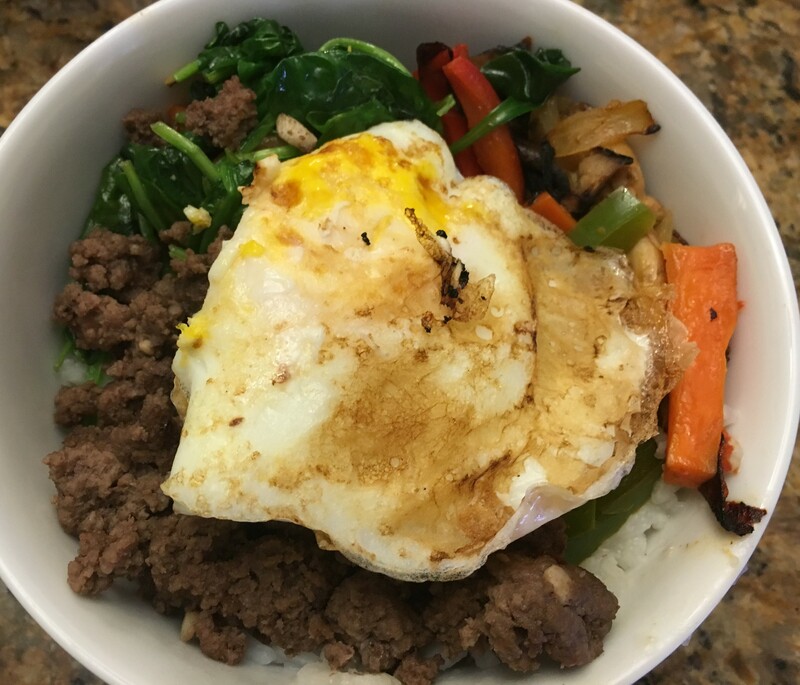 We've tried a number of bibimbap recipes and this one from My Korean Kitchen is hands down our favorite. It's easy enough for a weeknight meal and can be loaded with a ton of veggies. Plus it makes more than enough for lunch the next day! We had to make a few tweaks because we had trouble finding all of the ingredients regularly, but even with the modifications, this dish is filling and delicious! 1 pound ground beef we like 80/20 for this - you need the fat! 1 tsp sugar – we went with the original recommendation of brown sugar and decided dark brown sugar tastes best! The original recipe suggested this sauce might be only enough for 3 servings if you like eating it spicy and it holds true! 1 tsp vinegar I'm partial to this addition! For meat, mix the ground beef with the meat sauce ingredients. Marinate the meat for at least 30 minutes while you are working on the other ingredients. We usually make the meat mixture first and let it sit while we chop the veggies. Then chop the veggies into julienned strips. We usually combine the carrots, peppers and onion but leave the spinach and mushrooms to their own pans. Mix the Bibimbap sauce ingredients in a bowl. Add some sesame oil and 1/4 tsp of fine sea salt in a pan and cook the carrots, peppers and onion on medium-high to high heat for 2 to 3 minutes or longer if you liked them more caramelized. Remove the carrots, peppers and onion from the pan and place on a plate. Add some more sesame oil, another dash of salt and a bit of garlic and saute the spinach and mushrooms. Cook until the spinach is wilted. Remove from the pan and add to the plate with the other veggies. In the same pan, add some more sesame oil and cook the meat on medium-high to high heat. It takes about 5 to 8 minutes to thoroughly cook it. When the moisture has evaporated and the meat is cooked through, remove from heat and drain. Ladle the rice into bowls and add the vegetables, meat and egg. Cover with the sauce! I've eaten this dish three days in a row and I'm still not sick of it! You can also substitute ground pork or chicken for the beef. If you plan to use ground chicken, make sure you get ground chicken thighs. The ground chicken breast is too dry. p.s. even our toddler likes this without the spicy "sauca." It’s been a roller coaster of spring-like temperatures and freezing, regular February temperatures around here the last few weeks. That plus the lovely no six diet (no: dairy, wheat,eggs, fish, soy or peanuts) diet I’m on to help baby A’s digestive issues means we’ve had to get very creative with dinners. Luckily for me, J has taken the changes to our culinary repertoire in stride and has come up with a lot of alternatives to our favorite dishes. He found this lovely one from Food and Wine magazine. Since I was baby A wrangling, I only got a picture of the finished product. In a medium saucepan, heat the olive oil until shimmering. Add the onion and cook over moderate heat, stirring occasionally until softened, about 3 minutes. Add the garlic and the chipotle or ground chipotle, cumin and oregano and cook, stirring, until fragrant, about 2 minutes. Add the black beans and chicken stock and simmer, partially covered, for 15 minutes. Using a potato masher, coarsely crush some of the beans (we skipped this step). Meanwhile, heat a large skillet over high heat. 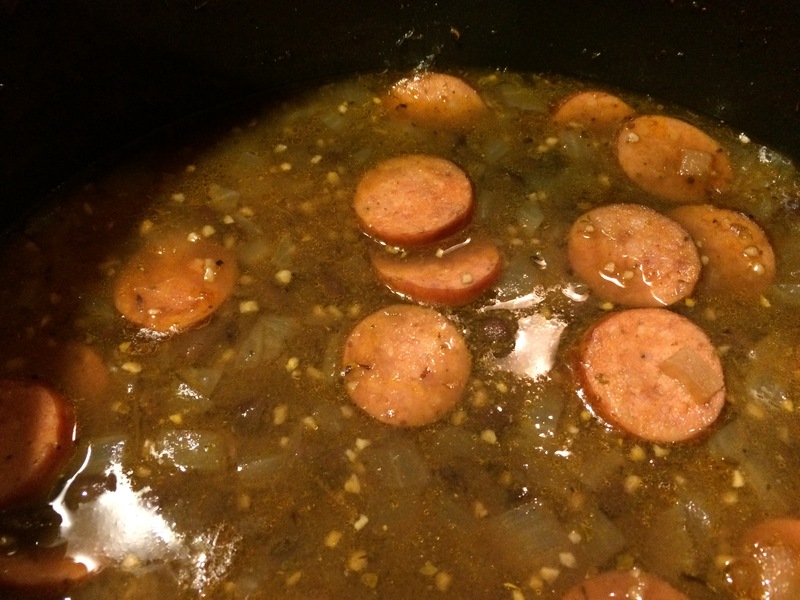 Add the sausage and cook until browned, stirring occasionally, about 5 minutes. Add the sausage to the beans. Then add the lime juice and cilantro. Season with salt and pepper. Simmer the soup for 2 minutes to allow the flavors to blend, or longer if you'd like! Ladle the soup into bowls and serve, passing the sour cream and lime wedges separately. I wasn’t sure what to expect, but this ended up being very filling and just the right amount of heat to warm me from the inside. It’s absolutely a soup we will add to the rotation, even once we (hopefully!) can start adding the no items back to my diet. J and I have been trying to eat more fish. Since one of my most favorites, seared tuna, is out at least until Baby Girl Tyler arrives in November, we’ve had to get creative. Last night, J found this super easy and really delicious Portuguese recipe from Food.com. We didn’t have any sole filets on hand, so we swapped out Swai (not sure what Swai is, check out this link from Consumer Reports) and it was wonderful. Since we didn’t want to figure out how to divide an egg yolk, we just made the full sauce recipe. Which turned out to be a great idea because the sauce was equally delicious over brown rice! Arrange fillet in broiler pan and sprinkle with a little lemon juice and dot with butter. Broil until fish begins to brown. While the fish is broiling, combine the remaining lemon juice, sherry, soy sauce, parsley, and egg yolk. Mix well. When the fish has browned, spoon the sauce mixture over fish and return to broiler until sauce begins to bubble. If you end up with more sauce than fish, like we did, add the sauce to a pan and heat on medium until bubbling. This ended up being perfect because the sauce on the fish soaked in. With a side of brown rice and broccoli, this was a super light and tasty dish. 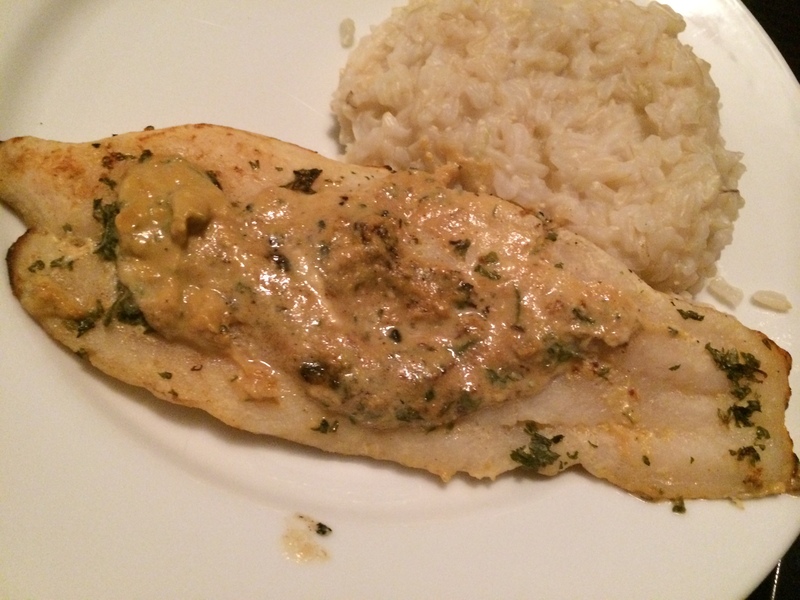 In total, it took longer to cook the brown rice than to make the fish from start to finish. Next time, we’ll add more fresh parsley at the end. Sadly, our town is lacking in good Indian cuisine. Which means, this fall J and I have decided to figure out how to make it at home. We’ll tackle naan soon, especially since we discovered how easy the main dishes can be. 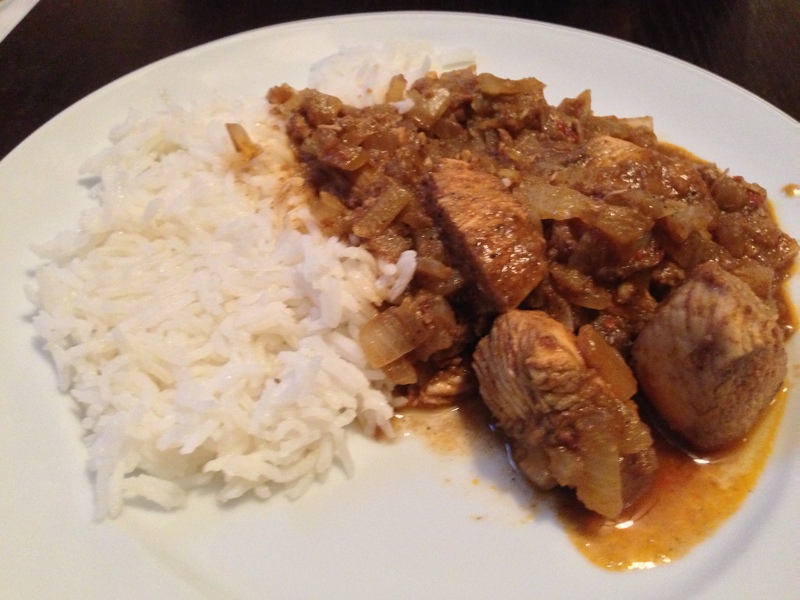 We tried Chicken Vindaloo from our new favorite site rasamalaysia.com. The directions were easy to follow, easier than finding all the ingredients! With a few modifications, we had a meal that rivaled any local Indian restaurant. Add vinegar and soak all the ingredients needed for the spice blend for 15-20 minutes. Then blend these into a fine paste using a blender. (we used the food processor and with the added vinegar, this turned very runny. Next time, we’ll remove the spices from the vinegar and then re-add it at the end). Add the spice mixture paste to the chicken and toss well to evenly coat all the chicken pieces. Let the chicken marinate for 4 to 6 hours. In a large wok heat the oil on medium heat. Add the marinated chicken and cook for 4 to 5 minutes. Stirring often. Add the chopped onions, tomato paste, salt and pepper to the chicken. Give everything a good stir. Finally add 1/2 cup of water (we omitted this step since it was already pretty runny), cover the lid of the skillet and lower the heat to low. Let the chicken simmer on low for 15 to 20 minutes or till well done and the oil start to ooze from the curry. If you prefer little thinner gravy add water as need and let it simmer for another 4 to 5 minutes before serving. Like the original author, we prefer the gravy to be thick and sticking to the meat pieces. Serve immediately over basmati rice. The sauce was a little runny for our tastes and it wasn’t quite as spicy as we like our vindaloo. Next time, we’ll use the spice blend as a run without the vinegar and add it at the end.